Ella Mitchell emigrated from England in 1975 with her husband Rob and three of their six children. She joined the Simcoe and District Youth Soccer Club in 1976 and immediately began promoting a girls’ soccer league and encouraging young children to join. She was president of the club from 1982 to 1989 and held every position within the club at least once. The Ella Mitchell Trophy for Squirt supremacy was donated in her honour in 1987, for developing the squirt league tournament. In 1988 at the Mayor’s Levee, in conjunction with the Olympic Games, she was presented with the National Citizenship Award for Community Service for her efforts in building soccer in this area. From 1982 to 1989 Eleanor was an active member of the Elgin-Middlesex Soccer Association and the Ontario Soccer Association. In 1995, Al Harrington donated the Junior Girls’ League Trophy in memory of Ella. It was, fittingly, a Rose Bowl that had special meaning because of Ella’s treasured rose garden in England. Ella did not confine her talents and energy to soccer. 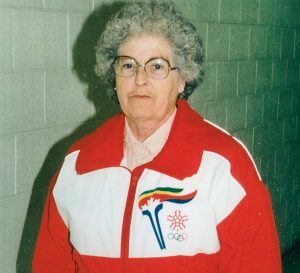 In 1981 she helped organize the Vic Jackson Novice Tournament for Simcoe Minor Hockey. From 1984 to 1988 she was a member of the Simcoe Minor Hockey moms and from 1987 to 1991 was Referee-In-Chief for Simcoe Minor Hockey. Ella acted on the philosophy that ‘any child, no matter of their financial or physical status, could and would play soccer.’ Ella dedicated her life to assisting children who wanted to play soccer. For that and much, much more, Ella Mitchell was inducted into the Norfolk County Sports Hall of Recognition.